When playing a round of golf on a sunny day, you will want to have a clear vision with a pair of sunglasses for golf. These will reduce any glare and help you see the course to the best of your ability without falling off during your swing. The best sunglasses for golf are the Oakley Flak 2.0 XL Sunglasses, which are so lightweight that you will forget you are wearing them. Unlike regular sunglasses, ones that are suited to golf will wrap around your face and are designed for functionality as well as comfort. Golf sunglasses will also be much lighter as they will be sitting on your face for a full round of golf and more. Comfort, durability, clarity and UV protection are the four major factors that sunglasses will need to meet in order to work well for golf. However, finding such a pair can be fairly difficult with all the different styles available. Many people will try to use their normal sunglasses to play golf with but they will never match to a true pair of golf sunglasses. This is due to the tightness against your face whilst being lightweight and comfortable for long periods of time. Playing golf in the sun is the great fun but if you are constantly blinded, it can show in your scorecard. Below is a list of the best sunglasses for golf that provide clear vision, comfort, durability and UV protection. Oakley is a reputable brand within the sporting sunglasses niche and these Flak 2.0 XL are ideal for golf. They are a standard size frame with larger lenses that are optimized for superior clarity when looking down the fairway. Unlike many of the alternatives, the Flak 2.0 XL is not polarized and instead uses a prizm lens that is designed to view the golf balls all the way down the fairway and close up on the green. Polarized sunglasses can sometimes increase the distortion of objects that are close but not the prizm golf lenses. These Oakley golf sunglasses also comfortably wrap around your face tightly so they do not fall off during your swing. They are also very lightweight to the point where you may even forget that you are wearing them. 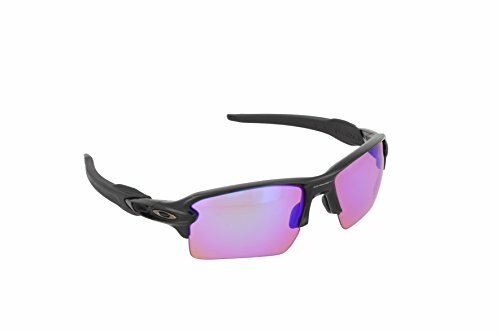 Overall, they are the best Oakley sunglasses for golf and you have peace of mind that they will last with the reputable build quality by Oakley. An added bonus is that they are prescription ready, which is highly desirable for many. Under Armour is a brand that is becoming very popular among the tour pros and for good reason. These are an affordable pair of sunglasses for golf that provide a comfortable fit that will not fall off during your swing. Under Armour offer these sunglasses with the choice of a polarized gray or brown lens with a black frame. The frame itself is made using a titanium-infused grilamid, which is very durable and will be able to withstand a vast amount of impact damage. The lenses are also coated with a UV protecting coat for added protection for your eyes. The patented ArmourSight polarized lenses deliver up to 20% more undistorted peripheral vision according to Under Armour. They also filter out 100% of UVA, UVB, and UVC rays whilst covering your eyes with a large lens. For those that are struggling to find golf sunglasses that are comfortable, the multiflection model by Under Armour are designed to do exactly that. This is thanks to an adjustable shock absorbing cushion hinges and a three-point grip for the perfect fit. Overall they are the best golf sunglasses for comfort and offer excellent value for money. 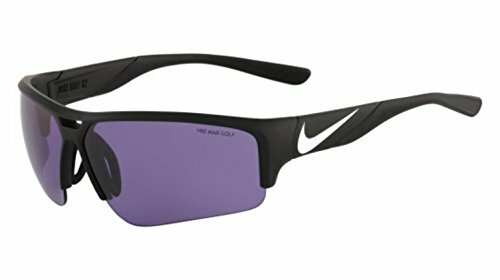 Nike is a big brand within the golfing world and these X2 Pro sunglasses use a lightweight nylon frame for added durability and comfort. You can even adjust the silicone ventilated nose bridge to further improve comfort. You are also able to adjust the silicone “Secure-Wrap Temples” for a custom fit so that they do not fall off during your swing and still remain comfortable. The deep lens provides maximum coverage at every angle and feature the MAX Optics Golf Tint that amplifies the white of the ball and enhances the contours of the green. The X2 PRO sunglasses by Nike are available in black/metallic silver, tortoise/lime green, white/black and bomber grey. 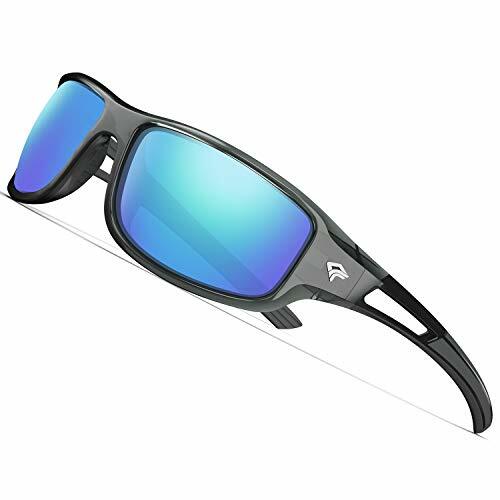 Overall, they are an excellent pair of sunglasses for golf with a range of styles to choose from. 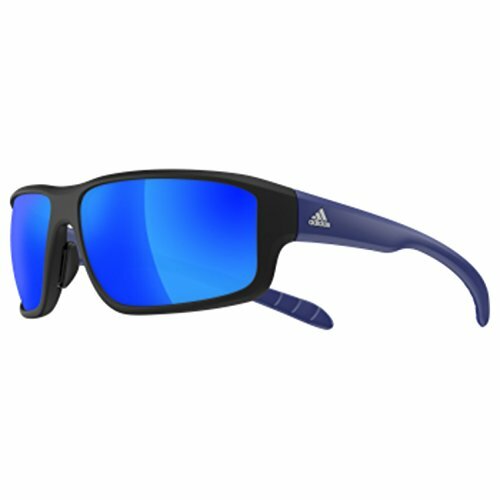 Just like Nike, Adidas is at the forefront of sporting sunglasses and these Kumacross 2.0 pair use a polycarbonate lens with a plastic frame in order to be light as possible. There is also excellent UV protection thanks to a special coating on the lens for additional eye protection. The Kumacross 2.0 sunglasses are available in a range of different frame colors and lens tint to suit your personal preference. Overall, the rectangular lens and the style of these sunglasses are very desirable and you can wear them every day if you wanted too. Many sunglasses for golf can look a “bit too much” for casual wearing but not these. The TOREGE TR90 are for those looking for a cheap pair of sunglasses for golf with a range of frame and lens colors. They provide excellent UV protection with a seven-layer TAC lens system and are backed with a lifetime warranty for peace of mind. Although they are cheap, this does not mean that the quality is poor. Thanks to a scratch resistant lens and a polycarbonate frame that will bend, they are one of the most durable glasses you can buy, which is why they come with the lifetime warranty. Overall, they are cheap sunglasses for golf that are ideal for just storing in your golf bag for sunny days. With a range of color schemes to choose from, there will be a pair that will suit your needs and they are cheap enough to buy multiple. It is the smaller things in golf that can bring down your handicap and this includes your eyewear. A pair of sunglasses for golf will not only block the harmful UV rays from your eyes but they will also improve visibility when looking at your golf ball on the fairway. Unlike a normal pair of sunglasses, ones that are designed for golf must be able to stay on your head during a golf swing. The standard pair of glasses may struggle to stay on and fall just as you are about to make an impact with the golf ball. There are many factors to consider before purchasing a pair of golf sunglasses and our buying guide should help you on your way. The coverage of the golf sunglasses comes down to the lens and how the frame wraps around your face. A frame that wraps around fully will provide the best peripheral vision but the taller lens will also improve the coverage and protection. Looking down the fairway to find your golf ball can be fairly difficult with a normal pair of sunglasses but this is where the golfing pair will improve your vision. It achieves this with clever lens tints and colors that silence the blue from the sky and enhances the green of the fairway and putting green. The lens color will also be able to improve the whiteness of the golf ball, which makes viewing the ball much easier on the fairway or putting green. As you will be wearing sunglasses for a full round of 18 holes, it’s important they are a comfortable fit. Compared with standard sunglasses, the golfing style is much lighter with lighter frames and lenses. 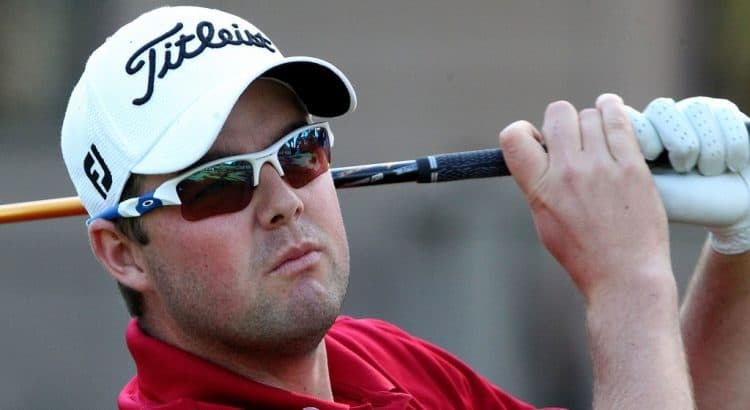 However, additional features such as rubber coated nose temples and bridges that are adjustable all increase the comfort levels when using golf sunglasses. The fit is also very important as the golf sunglasses are not designed to fall off during your golf swing. For that reason, the design of the frame will wrap around your head and sit tight to avoid slipping off. Wearing a pair of sunglasses is not all about the looks and being able to see more clearly. Protecting your eyes from the damaging UV light is very important for your overall health. The larger the lens, the more protection your eyes will have when out of the course, which is highly desirable because there is limited shade out on the course. Sunglasses for golf are intended to ingest blue light and the green of the fairways and putting areas are made more characterized by the golf ball being easier to view. It is not just the lens, the frame is much lighter and wraps tightly around the face so that they don’t fall off during your swing. Upgrading to one of our recommendations within this article will certainly improve your experience on the course. Viewing the golf ball clearly as well as the fairways from switching glasses is a worthwhile investment. 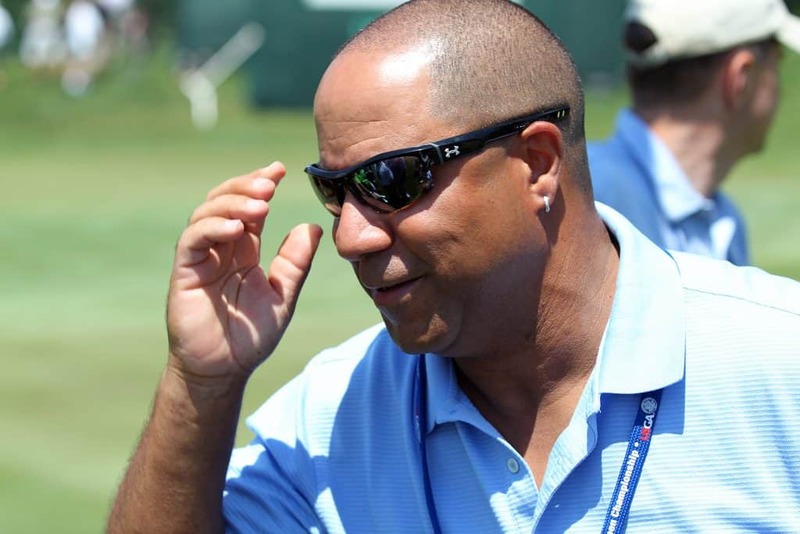 Golf sunglasses is not just a marketing stunt to get golfers spending extra money. They provide many benefits that ensure you can view the golf ball clearly and view all the characteristics of the green grass. The top brands include Oakley, Nike and many others, which we recommend sticking as they will be a lot more durable.